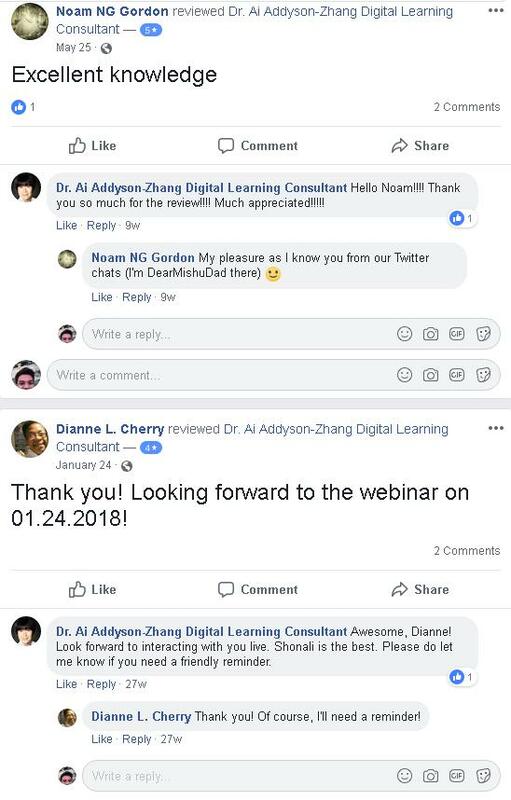 Testimonials — Ai Addyson-Zhang, Ph.D. Thanks for the interview @aiaddysonzhang. You are such a wealth of information. [Video] Why You Need to Understand and Own Your Digital Footprint https://t.co/4hQsMdRPBr I need all of you to RT and share with your colleagues and folks in your network. Also, please follow @aiaddysonzhang. She is a rockstar! @aiaddysonzhang You are a rock star. Your podcast is nice. It really was a fantastic chat. I learned heaps, thanks to you both! Ai’s Facebook Live interviews are superb. This is where she discusses so many things and recently finished creating a course in Social Media as Digital Pedagogy. it was an incredible interview! I absolutely adore the way you incorporate social into the classroom!!! It was my pleasure, love. Wonderful interview, Natasha. Thanks for sharing. Ai sure is an inspiration to teachers and students alike. She is 100% an inspiring educator and a wonderdul human being! Thank you so much for your support, Narmadhaa! "Incorporating social media in my teaching helps humanize who I am as a teacher. Students get to know me at a personal level and I get to know their interests and struggles at a professional and personal level." I know that you always do your best to add as much value as possible to your community, Ai! And this is just another lovely example of your mentality of giving. This was a fantastic FB chat. I’m so excited to learn more about connections based learning!! Can’t wait for Sean’s book to arrive and to implement it in the HE setting. 💯 "You need to find your voice, your own way of telling a story." This will ALWAYS outperform formulaic rules/AP English. Want a Realistic Perspective on Social Media Marketing? I second that ... Ai has done such a marvelous job of creating shows that bring all of us value every time! Those were really great insights! You will see me more often!!!! I was talking about your comments, really awesome!!!! Thanks!!! Your ENGAGING spirit inspired me to do this @aiaddysonzhang. You are the best. Still looking forward to drinking from the fountain of your social wisdom, come next wisdom. Ai is an amazing person with a sweet spirit! She knows how to be a real person on social media and has so much wisdom to share. I am grateful to be connected to her as well. Happy Weekend! Same here Ai. Congrats on your success in #Education & #socialmedia 😊👍👏 I learned so much from the workshop you & @neilparekh conducted yesterday @ #SMWKND Enjoy the rest of the weeken as well. great stuff here. Powerful neurological systems drive our fascination with video: we pay more attention, we apply more parts of our brain to decode, and we assign more value to the things we learn and observe. I'm convinced the video tide is only barely beginning to rise! Congrats, the world is yours. I pray for more global stages for your crushing delight. We are solidly behind you. @cinehead @aiaddysonzhang Wow!! Fantastic live discussion of digital storytelling in the classroom. Thanks so much for sharing your information and passion for teaching! @aiaddysonzhang is awesome.. you would not want to miss this.. learn from the best! My latest on #ContentManagement tips - to maximize reach and #engagement! Am proud to list the FB page of dear friend @aiaddysonzhang as a success story in one of the tips! Great chat w/ @aiaddysonzhang and @corinamanea. They covered blogging, personal branding and more. Loved the closing thought from Corina: "Super simple: just start." Fantastic! Bravo Ai! Well said! Your journey is inspiring & you're an amazing human being that sets a great example to all - you break walls & ceilings creating new paths for education & positively impact the people you connect with. Thank you for the gift of this connection! “Here I was, a Public Relations and Communication professor, and my student didn’t even know how to spell Pinterest. I took the blame personally. Professor @aiaddysonzhang was one of the contributors – so this is going to be good. You do a fantastic job Ai! Thanks for all you do! Enjoy your break! Be sure to follow both. So it’s Tuesday....whooops. Totally thought I hit publish yesterday. "When I try to be everywhere, I end up nowhere. When I want to master everything, I learn nothing." Sharing the story of my friend @aiaddysonzhang's inspiring journey and transformation as a person, educator and entrepeneur! YOU ROCK IT 🚀🚀🚀! When I try to be everywhere, I end up nowhere. When I want to master everything, I learn nothing. You are amazing Ai, thank you for being you and being brave to challenge the status quo. I love the difference you are making to education. In case you didn’t already know my friend @aiaddysonzhang was the superbestest - now you know!!! Thanks Ai. I read your inspiring story at Forbes.. Thank you for these SPOT ON tips! @aiaddysonzhang, I am now following you on Medium, Twitter, and every platform I can. Please keep sharing your great insight. I've just retrained as a SMM with @DigitalMumsHQ after 7yrs out so my journey is just beginning. You inspired me by how you've transformed your career in such a short time. Tips wise it has to be about getting family on board. We are going to Thailand too so it really sang to me! Amazing article about my friend and colleague, @aiaddysonzhang.